The holiday festive season is almost here! While the holiday season is super exciting, it can also mean stress and anxiety for both adults and children. This time of year often gets our minds racing with all the things on our to-do lists. There is usually a lot to organize to get our families together or get ready for trips. Adding yoga and meditation to your Christmas rituals might be the perfect way to bring calm, clarity, and peace to these busy months. How can we incorporate yoga and meditation into our Christmas festivities? First, let’s get out our Christmas and holiday books for inspiration. Make a list of all the things that remind you of the holiday season, such as gingerbread cookies, Christmas trees, snowmen, reindeer, candles, elves, or Santa. Now make a list of things that you do during the holiday season, like sledding, ice skating, making snow angels, caroling, sipping hot chocolate, or sitting in front of the fire. Think of ways to ignite all your five senses, like playing “Silent Night”, eating your favorite treats, playing your favorite games, baking your favorite food, or talking to your favorite people. Now that you are getting into the festive mood, let’s add movement and meditation. You could follow the suggested Christmas yoga sequence below or grab a yoga pose card pack and make up your own holiday-inspired Christmas yoga sequence. Don’t worry about practicing the yoga poses perfectly—just give it a go. Ignite your children’s learning by asking them questions: What does Santa do and why? What’s important about Christmas? What do you remember about past Christmas holidays? How do people around the world celebrate Christmas? What other holidays might people celebrate during this time? Use Christmas or holiday books to spark your children’s creativity as they invent their own yoga poses for kids or follow the Christmas Yoga sequence below. 1. 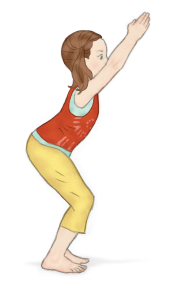 Star Pose (Variation of Mountain Pose) – pretend to be a sparkling snowflake falling from the sky. Stand tall with your legs hip-width apart and feet facing forward. Straighten your arms out alongside your body. Pretend to be a snowflake drifting down from the sky. Close your eyes (or gaze down in front of you) and take a few deep, calming breaths. 2. 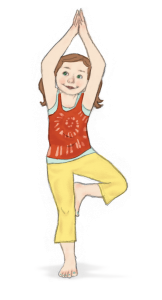 Tree Pose – pretend to be a Christmas tree with flashing lights. Stand on one leg, bend your knee, place the sole of your foot on your inner thigh, and balance. Pretend to be a Christmas tree with flashing lights and delightful decorations. Switch sides and repeat the balance on the other leg. 3. 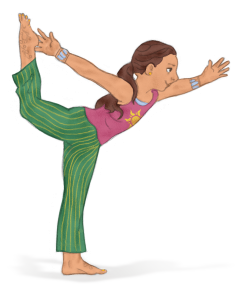 Dancer’s Pose – pretend to be the moon lighting up the sky. Stand tall in Mountain Pose. 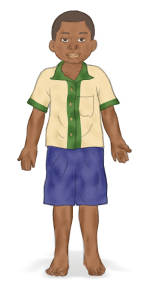 Then stand on one leg, reach the opposite leg out behind you, place the outside of your foot into your hand, bend your torso forward with your arm out in front for balance, and arch your leg up behind you. Imagine creating a moon shape with your outstretched leg. Pretend to be the moon shining over a forest of pine trees or a house filled with sleeping children. 4. Chair Pose – pretend to be a candle flickering on the mantelpiece. Stand tall in Extended Mountain Pose with your feet hip-width apart and your arms extended above you. Then, bend your knees and sink back as if you are sitting in a chair. Imagine that you are a white candle flickering light over your family. Hold Chair Pose for a few rounds of deep breaths. You should start to feel heat in your body. 5. Easy Pose – pretend to be a log fire with dancing flames. 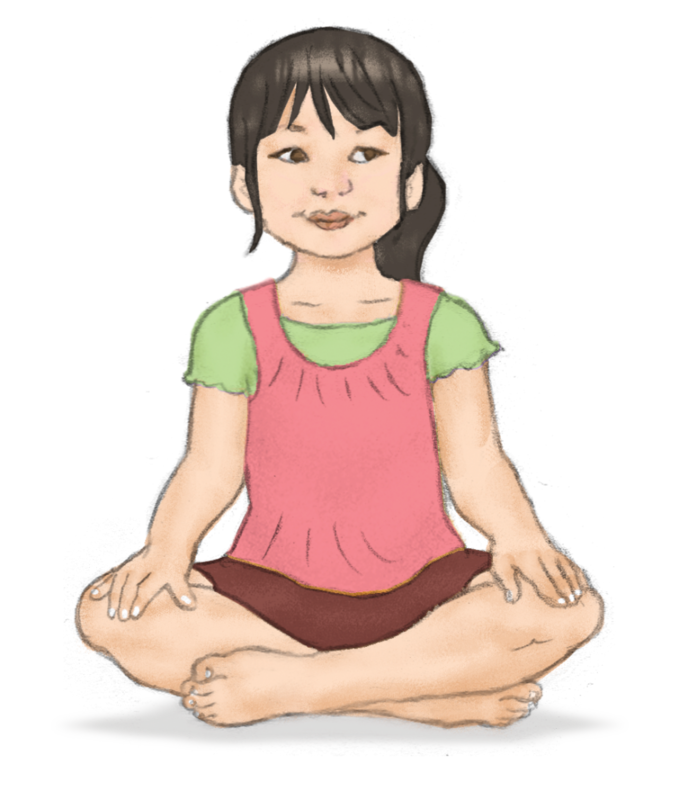 Sit comfortably cross-legged and rest your hands on your knees. Close your eyes (or gaze down in front of you) and imagine that your crossed legs are the logs on the fire. With every extended inhale, imagine filling your body with fresh oxygen (fire). Simply focus on the sound of your breath and begin to quiet your mind.